Hello...I'm a bit lost on how to confront my situation. I had a reading done and I was told that my now ex has work being done by a woman he is seeing. The thing is this woman is in another the country and according to my reader, she has a family member doing work on him for her. I was told it may have some to do with dirty underwear buried in a graveyard. This woman seems to be having marriage work done on him and my reader told me that he is in love and is at a point that he doesn't hear or see anyone else but her. My reader has offered to do work for me but it was only to sweeten him him towards me and make him want me more, not so much as to get rid of the other woman. My question is, is it possible to try and do break up work when she is in another country, it's impossible to get any personal concerns of her but I can definitely get his? Should I even attempt to try and get him back or just count this as a lost and move on? Thank you. Spellwork can indeed work from a distance, but it is harder to accomplish. Not impossible, just harder. You can put them both in a vinegar jar and identify her as "the woman (X) is currently dating" or words to that effect. It is a weaker link vs. personal concerns, but I have seen this kind of work succeed in the past. As for whether you should attempt the work or count it as a loss is entirely up to you. But it's worth a try. I know her name, D.O.B, and have pics of her....will that do? Yes, absolutely that will do nicely! Hi there, I have a couple of questions about seperation and hot footing from a distance. The couple in question aren't exactly a couple, more like friends with benefits. I'm currently doing a vinegar jar and requested for hot foot and inflammatory confusion candles to be lit. I was thinking of making sure the hot foot powder gets in physical contact with one member of the couple however I am physically unable to get anywhere near their home. I was thinking of dusting a letter with it but the only problem is they will know it came from me as I am overseas at the moment and it will show on the postmarks. So I may leave that plan out all together or I was thinking of dedicating the effects of the letter to the target only but sending it to a neighbour of theirs "accidentally" so at least the vibe of the spell is in close proximity to my target. Will that work? Also I was told once that a spell cannot cross over the sea or the ocean, so for example if I lived in Australia and worked a spell on someone in Canada it wouldn't work because it can't cross the water. Is this true? Getting at least one of your targets in contact with the powder is the right way to work. Dusting a piece of mail and sending it to them is a longstanding tradition that has been known to work, even across continents. If your current location would be a giveaway, is there someone you know in your target's country that you could send the mail to and they could in turn mail it to your target? If so, I would stuff your tricked mail into an envelope and put that in a larger envelope to your known contact, who would then send your tricked mail to your target (make sure to send them money for the local stamp as a courtesy). Mailing it to a neighbor to have "the vibe of the spell in close proximity" isn't how this works. You want that powder on your target directly. Is there a AIRR rootworker that specializes in break up work? If so can some link/ refer me to him/her please and thanks. Thank you for your reply and helpful information. Unfortunately I don't know anyone who may be willing to send the letter onwards for me. It's hard to find an answer to why I can't post it directly to the person and why LOL. If you can't physically get your powder onto your target, you can work sympathetically through candles in addition to the ones you have had lit. Setbacks will happen; you can only control your own attitude and how you react to them. Stay faithful in your work! I'm currently working a break up on my target. In the last month I've lit 2 7 day break up candles back to back & I am working a vinigar jar already. Now it's been 3 weeks and I've seen very blatant signs everywhere but NO MOVEMENT! It could be too early still.... but today I have access to my target. I want to take advantage of this & will definitely be collecting his personal concerns. BUT what can I deploy in his vehicle or on his skin that could help contribute to a break up? Could I maybe rub the break up oil on him? Or sprinkle hot foot in his vehicle to get her to stop going around him? Would sprinkling break up powder in the vehicle work better? Welcome to the forum. I realize you are new but please do not start new topics without doing a thorough search of the forum. We already have threads on conducting break up work and I have moved your post to the general thread on the subject. Please read through this thread for advice and ideas on how to break your son up from his current girlfriend. As for putting something on him when you next see him, you can give him something as a "gift" that has been dressed in Break Up products, preferably a light dusting of the sachet power. Best if it's something the two of them can both touch and share, like a wrapped box of chocolates. Meanwhile, keep him in a honey jar with you and your family to keep your relationship strong and happy. Three weeks is not a long time. You need to have patience. If you have access to him, I advise against using Hot Foot unless you want to drive him out of your life as well. You can lay down Break Up products in his car, especially if you know she will ride in the car with him. Include the passenger seat as well if that is where she normally sits. Welcome to the Lucky Mojo forum. I don't think you need to worry--adding the Hot Foot Powder to the jar should help drive these two people away from each other, not drive the man away from you. I'm so sorry to hear that someone broke into your house and assaulted you, that's terrible. Did you report the attack to the police? I don't know what went wrong with your vinegar jar, I think this would be a good moment to get a reading to find out what's going on. I want to make two people hate each other and separate them forever. They are constantly together but they are very bad influence on each other, she dragged him into gambling and he dragged her into drinking. Now I do not hate any of them and wouldn't want to bring any hard harm on them but I do want to separate them. I did read few suggestions on here but I didn't find good explanation on them. For example how do I do freezing spell? Or a picture spell? I will try anything. I do not have access to their belongings at all, only pictures. This certainly doesn't sound like the work is justified. If they have bad habits, but love each other, then try to influence them to get counseling. You can do both sides. it would be awesome if they both touched it and got into the car together! Well I did it. Except it wasn't her car bc I couldn't find it tonight after looking but I knew thatey be at this bar so I waited & hid until I saw them enter. I went into the bathrooms & layed my powders & oil & the funny thing was was my rival was in the bathroom waiting as I walked out & I had some hidden in my hand & as I passed her I smiled & said hi oh how good to see you as I threw it down at her feet lol the hot foof powder too as she clung to my ex as I walked by them LOL I'm thinkg go ahead & laugh skank, mwahahaha I've been laughing this entire time bc I've tricked your path all night LOL Ugh I'll be sooo darn glad when all this is over & they break up ugh. I didn't get to count my steps sadly & wasn't able to walk backwards as I layed them bc there wasn't enough room in the in bathrooms without all the other people in there seeing me do it. I also walked up right behind them and threw some break up powders at both their feet LOL I feel so much better since I've done this. I actually had to go back & throw more powders when the bathroom emptied out bc I didn't want anyone seeing me throwing weird dirt stuff lol. Well that's certainly the gutsy way to do it! Nice work, hope you see the results you want! If I were to add a few drops (breakup, hotfoot or separation) in my Ex’s cologne for intention of him breaking up with his controlling gf, would that work? I would petition for him to quarrel with his gf so much to the point of him having enough and breaking up with her. My worry is that when he has it on, would it affect me and others around him? Please let us know the outcome. I LOVE sneaky tricks! I have been trying to break up a couple for almost a year now. I did a vinegar jar. 2 lucky mojo 7 day separation candles back to back. Yet they’re still almost inseparable close to a year later. I did a reading back when I did the separation candles and was told they would separate but I needed to order and burn a second candle which I did. I don’t have much experience with separation candles but I know with break up products I have had luck in the past and it did not take this long. Although I would prefer a peaceful separation at this point would I need to escalate to break up products? Any other suggestions? I was thinking about seeing if you guys have break up or separation powder and dusting his clothes with it? Okay so I need help. I am married but currently separated and working to get my husband back. I am currently working a honey jar reconciliation spell and burning healing incense to bring us back together. Now suddenly comes an intruder and he likes her. I will not give up on my marriage nor my work but I was wondering if it would be better to do a vinegar jar, freezer spell hotfoot spell or break up and stay with me combo spell with the three candles I saw on the LM break up spell page. I want this woman gone out of his life before she ruins the progress we were making. I was wondering if you could give me some advice or recommendations. I’m doing some break up work at the moment and have obtained notes/hand writing of the female. How can I incorporate this into my work? I currently only have influence oil and inflammatory confusion powder to work with before I get some new LM supplies. Any words would be really appreciated. As far as the graveyard dirt, you may want to get a quick reading to find out if your spell is making him sick, and if it is, you'll probably want to stop the spell if you don't want to sicken him. When trying to remove a rival from my partners life, should I do a vinegar jar, hot foot, freezer, binding, banishment, protection, or shielding? I am confused. Context: this person is interested in my partner and does know that we are in a relationship. This person is my partners coworker. This person has also bren working on my partner and attacking our relationship. I can get a picture but I do not know her home address. I have her email, phone number, and work address and that's it. This person is also a witch. I do not know where to start or what to do. Those are methods of working. Let's say someone gave you a bunch of flour. Should you make bread, cookies, cake, or wallpaper paste? It's YOUR choice! In other words, all of those ways of working are traditional folk magic, and no one can choose for you. I’m doing a vinegar jar tomorrow. Perfect timing as we are in heading into Saturday. I have confusion oil and break up oil, poppy seeds, going to use a fresh red scotch bonnet red pepper, to make them fight. I’m using lemons, going to get a pic of them together, cut it in half, place it back to back dressed with oils, their info, and stick it in the lemon, with 9 needles, pins, nails, graveyard dirt. I will light black dressed candles on top. I don’t have black dog/cat hair. I know he wants me. He’s stuck going back and forth with my rival. Oh, I have his hair, nothing of hers. She had to go. Once and for all. She’s making him leave me all the time, when I know deep down he wants me. I believe somebody did something to break us up. I want her gone. Sorry, Dazed_Confused -- we make everything by hand, first come / first served. No rush orders. This thread -- the "General Break Up Separation Hot Foot Questions and Answers" thread -- is not intended to be a dumping ground for people who cannot figure out where to post their current situation or life story. If you came to this thread to ask about the history and practice of break up, separation, and hot foot spells IN GENERAL, then you are at the right thread! Hurray! Those are SPECIFIC break up, separation, and hot foot situations -- and we have almost 60 different topic threads to cover those and other specific break up, separation, and hot foot situations. This is the thread about break up, separation, and hot foot spells in GENERAL. PLEASE, i beg you, as an overworked admin, don't do this to us. 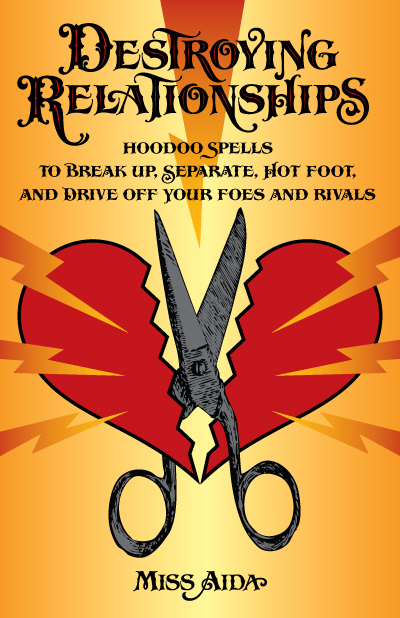 PLEASE post your SPECIFIC break up, separation, and hot foot spell questions in one of the 59 other SPECIFIC break up, separation, and hot foot spell topic threads. Hello I started a break up spell and tonight will be night 7. So far I believe it’s successful given the signs in the wax but I do have 1 concern. Last night, night 6, I lit the candle and put it out after 20 minutes. When I was done I went on instagram and notice one of my targets were actually awake. Will my work be affected by him being up? No, I don't think your work will be affected, especially because it was on night 6 and the spell has had time to get momentum. Take care. I used break up & separation products in the form of candles & some break up jars on a couple in the past due to some toxic things they did to me. But I have since healed and would like to uncross them. I’ve noticed there’s a lot of information on this thread about how to use these products but not really how to back track once you’ve used them. Would I approach this situation the same way I would approach any uncrossing work for a third party? Also, will removing the break up/separation products influence on them cause me any hardship since I originally caused the caos?